Apparel product specification sheet, also known as spec sheet or BOM (Bill of Material) is an important sheet containing details of the new styles/ designs. It contains all the important data regarding the style. Essentially, spec sheet should be issued to the development merchandiser by the buyer whenever a sample needs to be made. This will enable product development team to know exactly what is supposed to happen with the construction and trims for each style. When the factory has a complete set of detailed instructions, the execution of accurate samples will improve the turnaround time and simplify communication during each stage of manufacturing and quality control. In essence, the Fashion Spec Sheet is the “blueprint” for sample development and garment production, as it contains all the necessary components required to manufacture it. The Fashion Spec Sheet is also useful as a resource document for purchasing materials and trims. It is important to pay attention to the spec sheet and update it as the style progress towards becoming a production style. During the sampling process, it is highly likely to change certain style details, fabric and trim specifications. Some changes are significant hence chances are, a buyer will send an updated spec sheet yet some changes will be minor hence may not get an updated version. It is vital to make a note of the changes, including the date and the time of the change occurred. Its good practice to keep a hard copy of the email in the file. In an unlikely event if buyer disputes any of the changes, having a clear paper trail will put the manufacturer in a position of financial security. If the factory ignores or fails to follow any of the information on the Sheet, they will be at fault and have to face the consequences such as heavy discounts, re-do the samples or cancel orders. Fashion Spec Sheets include detailed technical drawings, also known as flats, along with construction notes, finished garment measurements, fabric yields and material and trim details. If available cuttings of fabrics and trims should also be attached to the sheet. Some designers even choose to also include the measurement grades between sizes as well as the detailed size gradation for the garments. The more information it contains, better for the development team as it reduces the confusions and misunderstandings. Also read: What is specification sheet? Listed below are some of the essential information specification sheets should contain. 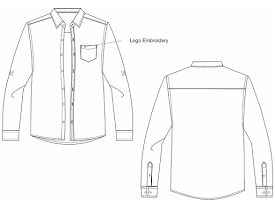 Product sketch: Product sketch should include front and back line drawing with the measurement details for the garment. Every product components and special comments must be marked on the sketch. Fabric details: Fabric quality must be mentioned in the spec sheet. If possible material swatches, Product code, Fibre content and supplier details (pre-approved vendors). PoMs (Points of Measure): The various size measurements of the required item. The 'point of measure' will be used to check that the measurements are correct on the finished garment. Print placement: Information regarding the type of print on the garment and its placement. Embroidery placement: Information regarding the type of embroidery, its size and placement. Garment washing instructions: Details of wash finishes for items such as denim garments. Accessories details: Trim details, fastenings required with product codes, fibre content and supplier details. Label placement: Requirement of different labels. Placement details for brand logo labels and care labels in the garment. Comment section: Used by the factory to make a note of anything related to the construction of the garment. The Points of Measure (PoM) are very important to ensure accurate execution of the garment during its production. In summary, it is very important to request a spec sheet from buyer for each design. Often development team do not request or follow up on NEW spec sheets for repeat orders. This is a risky practice. Even with repeat orders such as school uniforms or basic products which include solid colour round neck T shirts and similar product categories have small changes. This may be a measurement point, placement of a label, stitch pattern or any minor detail. Sometimes these changes occur based on customer feedback or buyers internal risk assessment meetings. Failing to have an updated version of the old spec means, manufacturing plant exposing themselves to buyers claims. 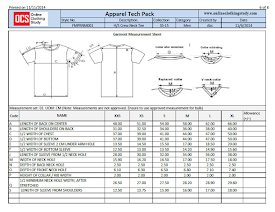 Learn about apparel product specification sheet. Contents of the apparel spec sheet.